This is a test of the Auntie Shoe broadcasting system. I have accounta at Twitter, Tumblr, Facebook and more. They are supposed to be set so that posts from this blog show on these accounts. Your Auntie Shoe wants to test this system to be sure that posts aren’t showing up on one account more than once. That’s annoying. Don’t want to annoy. This had been eight-year-old Toksie’s very first Christmas experience and it happened at the North Pole. Santa himself gave Toksie the first Christmas present she ever received. It was a doll. But, it was a very special doll, because just like Toksie, the doll could change colors. Her hair, teeth, skin, eyes, EVERYTHING about her could change color. And patterns, too. Toksie could have stripes and polka dots and paisleys and, OMGosh, just about anything. And, so could the doll that Santa gave her. It was pretty cool, indeed. Christmas at the North Pole is a very laid back affair. Everyone is tired after Santa’s big ride. And the circus that Toksie now lived with, well, all those people were tired from performing for the elves all night while Santa delivered presents. So, about 6:00 PM everyone gathers in the Great Hall for dinner and a gift exchange. That’s because they have been sleeping all day. Most of the elves and the circus people attend church beforehand. But everyone arrives in the Great Hall at six o’clock. They all dress in their best clothes, not tuxes and gowns, but very nicely dressed. Suits and ties for gents and fancy (not fancy-schmancy, just fancy) for the ladies. The circus people were helping Toksie get a wardrobe that wasn’t all beige. They found her a lovely red pants suit and a green blouse to wear. She had new gold shoes and silver socks, too. Not real gold and silver, just the colors. She sure looked Christmassy. And, that was the idea. Almost everyone was dressed in greens, reds, silvers, and golds. There was some white. A couple of people wore blue. And, lots of other things as well. And EVERYONE had a present for Toksie. Some people had two or three presents for her. Every elf and every circus performer has something for Toksie. Everyone had gone to very special trouble to be sure Toksie’s first Christmas was memorable. And it was. She was NEVER going to have to wear beige again, that was for sure. There were sweaters and pants and blouses and dresses and shoes and boots and necklaces and rings and bracelets and lockets and t-shirts and watches and sweatshirts and hoodies and OMGosh! There was so much stuff to open it wasn’t even funny. And the TOYS! WOWSIE-ZOWIE COOL! Toksie had never seen toys before she got to the North Pole, they were illegal in Crudville. She had never played before. That was illegal, too. Children, as soon as they were old enough to understand, went right to work at something to bring in money. That’s it. Straight to work, no school. Nobody could read anyway. That was illegal in Crudville, too. Still Toksie liked these toys. She got a yo-yo, a deck of cards, some balls of all different sizes and shapes, a tennis racket (with lessons, too), lots of dolls, some furniture for the dolls, a train set (WAY COOL! ), drawing paper and pencils, some paints, video games (with LOTS and LOTS of batteries), a doll house, building blocks, building logs, plastic thingies to build stuff with, and just about every toy that anybody could have ever wanted to have. Well, that toy chest was just a normal looking sized storage place. Just big enough for an eight-year-old to carry. BUT EVERYTHING fit. YES, E-V-E-R-Y-T-H-I-N-G!!!! It was not bigger than a suitcase, but it fit all these toys. Honest. Really. It did. AND, it was LIGHT, too. All those toys should have been really heavy, but Toksie had no trouble picking it all up. She got something Mrs. Claus called a “travelling closet”. It was the size of a HUGE closet. I mean, you never in your life saw a closet this big. Which was a good thing, because Toksie received a LOT of clothes. Of course, everything fit. But she wondered how she would ever get all this back to her room. The closet seemed bigger than the room, too. But then, Mrs. Claus told Toksie about her secret password. And, she showed Toksie where to whisper the secret password into the closet. Toksie did it and you will NEVER believe what happened. The closet shrunk. Down to almost nothing. Toksie could put the travelling closet in her pocket! All her clothes and shoes and jewelry and hats and caps and OMGosh EVERYTHING fit in her pocket. So, now Toksie Turbie had a magic travelling closet and a magic toy chest. And then the really cool stuff started to come in. THE MAGIC STUFF. Elves can do magic, and some of the circus people, they could, too. All of them wanted to make sure that a little girl like Toksie would be safe in the world because she was all on her own. The magic things they gave her were their way of making sure she was looked after, without her knowing it. She got a hat that would give her three wishes. She got a jar of pills that would never get smaller but made her invisible when she took one. She got THREE magic wands, each had a different trick that would protect her if she was ever in danger. She got so many magical things for this that and the other thing, it is impossible to list it all. Most of them came with instructions, too. Some came with lessons (to be had later). And, she got another magical storage crate for all her magical stuff. Everything fit. Then she said a magic word and it shrunk to fit in her other pocket. Toksie couldn’t read. Never learned in Crudville. No school. Reading was illegal, so why have school? 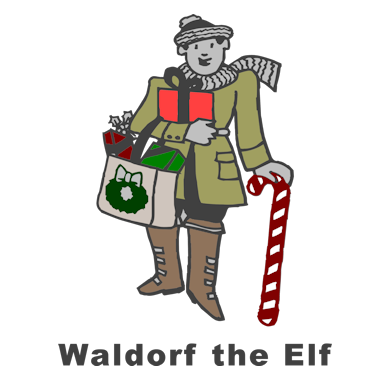 But, a lovely grey elf named Waldorf had a very, very special gift for her. He gave her a book. When she protested that she couldn’t yet read (but really wanted to learn), Santa and Waldorf and all the other elves, told her to just open the book. So, she did as she was told. And Waldorf threw some special magic dust on her and low and behold…Toksie could read. She could read all the words in the magic book. She could read all the books she got for presents, too. And, yes, she also got a magical library for all her books. It was small, but everything fit. Just like the travelling closet and the magic toy chest and the magical crate. After all that, Morty and Santa brought out some furniture for her. Just the stuff little girls love. Frills and stuff. A dresser with a mirror for her to dress at, and a bed with a canopy. But the bed had special instructions. It came with a BOOK to read about how to use it. AND, it had a console in the headboard with a voice-activated computer in it. AND, are you ready for this? Are you sitting down? Can you take it? THE BED COULD FLY! Yes, the bed could fly anywhere in the world, even beyond. It could go to the moon and the stars and other planets. Or, it could go down into the oceans and seas. It was the coolest bed you ever saw. Morty explained how it worked. It was kind of like Santa’s sleigh. But where it was different it was waaaaaaaaaaaaaaaaaaaaay different. First, you could have as many people on it as you wanted. And, like the travelling closet and the toy chest and the magical library, whatever you put in it, fit. It just did. Adults could not go on the bed. Well, they could. But something happened to them when they did. They became 12-years-old again. No one older than twelve was ever on the bed. As soon as they put a foot in, the foot became twelve. And, the rest of them followed as they went on the bed. Toksie had a TERRIFIC first Christmas! The flying bed was one of the greatest gifts Toksie got that first Christmas. Morty suggested that some of them take a ride on it, (just to try it out, of course), to the South Pole Village. Santa has a twin brother named Zanta. Every New Year’s most of the elves and Mr. and Mrs. Santa Claus, take a trip to the South Pole Village to see the South Pole elves and Mr. and Mrs. Zanta Claus. So, on New Year’s Day, everyone got ready to spend a week or so with the Zanta Clauses and their friends. Some people travelled by sleigh, with Santa and Mrs. Claus. Other people went via the flying bed with Toksie, Morty, Waldorf and a few other people. Watch this space for the details of Toksie Turbie’s exciting trip to the South Pole. Just feeding the SEO Monster here. It wants a link, so this time we have the web site for a writer in Glascow, Scotland. His name is Graham Gibson. He writes for grown-ups and his web site is www.graemegibsonauthor.com. Do take some time and visit! Toksie Turbie was told that every year there is a special dinner with Santa for all the people in circus and the elves. Each year it changes, just for fun. Sometimes, it is a big, formal affair with tuxedos and long gowns and much ado about everything, including a special fork or spoon for each course in the meal. Other times, it was very, very casual with boxed dinners and sitting on the floor in jeans and T-shirts. And at other times it was something in between. Mrs. Claus always decided how the dinner would be served and what would be eaten and all the other important details that go into a big, huge dinner like this. She usually decided how fancy it would be by figuring out how busy everyone was, getting ready for Santa’s yearly ride around the world to deliver presents. If they were ahead of schedule, the fancy-schmancy dinner with tux and gowns would occur. If they were waaaaaaaaaaaaaaaaaay behind schedule, it was the boxed dinners eaten a bit quickly, but fun, nonetheless. And, so on. This year they were not ahead of schedule, nor were they behind. So, Mrs. Claus planned a lovely, semi-casual dinner. A buffet. Serve yourself and no fuss, but not very hurried. Everyone was told to dress nicely, but not too fancy. Toksie had never been to a dinner party of any kind. Crudville really didn’t do parties. So, she was looking forward to finding out what this was all about. And, she was wondering what Santa was going to say about Christmas, because she sure was curious about all this fuss and bother. It seemed like a lot of fun and she wanted to know what it was all about. Toksie Turbie really loved her new red pants with the green top. She had new blue shoes, too. She decided to wear those. And, for fun, she decided to make her hair, skin and teeth match the red and green striped wallpaper in her room. Santa was greeting all his guests, so he didn’t have time just then to explain Christmas to Toksie. So she wondered over to the buffet table to see what a buffet actually was. OH, MY GOODNESS!!! Toksie had never seen such a lovely bunch of things to eat in her life. There was ham, turkey, roast goose, beef brisket, almond chicken, egg rolls, lumpia, dolmades, rice pilaf, lasagne, baked bree, tamales, hummus, fresh veggies and so much more she didn’t know where she would begin. And she hadn’t even seen the dessert table yet. OOOOOOOOH, MYYYYYYYYYYYYYYYY GOOOOOOOOOODNNNNNNNEEEEEEEEEEEEEESSSSSSSS! The dessert table!!!!!!! It had chocolate cake and angel food cake and strawberry cake and cinnamon cake and whipped cream cake and lots and lots of every kind of cake you could ever imagine. And pies, oooooooooooh, the pies, pumpkin and apple and cherry and blueberry and blackberry and apricot and peach and pecan and chocolate and lemon meringue and all the pies you ever wanted to taste in your life. Then there was the ice cream table. A special frozen table with chocolate, strawberry, vanilla (who let vanilla into this fun group? ), peppermint, chocolate chip, licorice, and every ice cream you ever loved in your life. And pastries, OMG, pastries, chocolate eclairs and cream puffs and napoleans, and so many more scrumptious things you’d never know where to put it all in your tummy. Toksie Turbie was really looking forward to this meal! Morty found her looking a the desserts and suggested they sit together at the big, huge dining table. Toksie thought that was just a perfect idea and the two of them went off and found some seats. Soon after, Mrs. Claus announced that it was time to eat. So everyone lined up at the first table and got their turkey, egg rolls and whatever else they wanted from there. When everyone was seated, again, Mrs. Claus asked Santa to say a prayer. Everyone bowed their heads and Santa gave thanks for what they were about to eat. He asked for a blessing on everyone present and that all the circus people would be safe in their performance and all the children of the world would get their presents without a hitch. Then Santa said “AMEN” and everyone else did, too. After they had eaten their main courses, but before everyone visited the dessert tables, Santa asked each elf and circus member to say a few words about what Christmas meant to them. The first elf said that Christmas was a time to bring children joy. The lion tamer mentioned that Christmas made him joyful because it had an opportunity to bring fun to the elves. Each one at the table mentioned something that had to do with giving of themselves and how it made them joyful. Then it was Toksie’s turn. Morty smiled at her, knowing she hadn’t the foggiest idea what Christmas was, and recalling his first visit to North Pole Village and how Santa had explained things to him. Morty thought he knew what was about to happen. Santa smiling back at his wife, whispered, “Don’t worry, dear”. “What’s a birthday, Santa”, asked Toksie. “That darned Crudville”, said Santa, under his breath. “I never had a birthday”, Toksie said. “If it is Jesus’ birthday, and people get presents on their birthday, the why doesn’t Jesus get His presents?” Toksie was thinking that Jesus was getting gypped on this deal. With that, Santa announced that it was time for dessert. Everyone has a great time at the remainder of the dinner party . And everyone was ready for Christmas in their hearts, too. Picture of Toksie on the wall by Auntie Shoe. 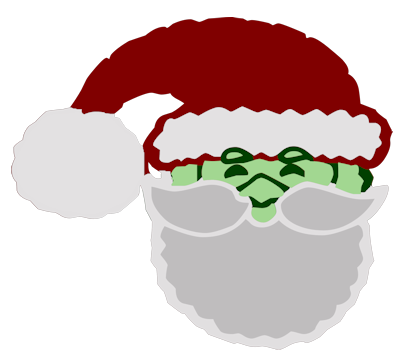 Picture of Santa from a purchased font and colored by Auntie Shoe, with permission. (C) 2013 Auntie Shoe. All Rights Reserved. Morty was quick to find a place for Toksie to sleep in the circus. She had her own room in one of the trailers. It was not beige. It was pink, just for her. Well, when they painted it pink they didn’t know she was coming, but it fit her just the same. Morty explained that her part in the circus would have to be worked out after Christmas. This was because every year this particular circus went to the North Pole Village and entertained the elves while Santa delivered presents to all the children in the world. It was already December 20th. The circus only had four days to get to the North Pole and get the show all set up. OH, MY GOODNESS! You never in your life saw so many people move so fast to get somewhere. They left directly from Crudville. Packed all the trucks with costumes and scenery and tents and assorted circus stuff. When they reached the farthest point in Alaska, there was a special train waiting. It was the train to the North Pole Village. They had to unload all the costumes and scenery and tents and assorted circus stuff. Then, they had to re-load it in the proper place on the train. All the animals had to be moved from the trucks to the train, and placed in special cars. All the trainers had to be sure the animals had whatever they needed. Then, the train left the farthest point in Alaska for the North Pole Village. When they arrived, all the elves and Santa took a break from making toys, wrapping them, and loading them into Santa’s sleigh and watched the parade. Yes, every year, when the circus arrived at the North Pole Village there was a parade. A very short one, I might add, because elephants and camels and tigers and horses can get very cold, very fast at the North Pole. Not to mention people. But, they still had a big parade. The elves, Santa, and Mrs. Claus lined the streets of the North Pole Village to watch. The elephants came first, with the lovely ladies in blue tutus riding on the top. STANDING even. The lovely ladies in the blue tutus stood very tall atop their elephants. The ladies were very cold in their scant tutus, but since it was all for the entertainment of the elves, it was a short parade, and it was once a year only, so the ladies were happy to do it. Next came the camels. They were not used to the cold weather. The camels walked with men riding them with great safari hats on. The men, not the camels. The elves liked the camels best. The camels knew it and they smiled as big as a camel can smile, even though they were FREEEEEEEEEEEEEZING. If the ladies in the blue tutus knew that the elves liked the camels best, you can bet your bottom dollar those ladies would have been wearing proper fake fur coats. Yes, indeed! Why fake fur? Because it is very rude to wear a tiger skin coat in front of a tiger. You might accidently be wearing the tiger’s relative. And that simply will not do, now, will it! After that, the tigers went past in their cages, with their trainers walking in the front and back of the cage. It just isn’t wise to let a tiger out of its cage in the North Pole Village with all the little elves about. Then came the horses. the riders were wearing silks and satins and lots of cool hats with ribbons and all kinds of cool colors. Every color you like best, Mr. or Ms. Reader, was present and accounted for, honest. All your favorites. Every one. Santa had a special building just for the circus. Special places for the animals to be safe and warm during their stay. Each member of the circus had their own room in the building. There was even a room for Toksie. It was sooooo cool and Christmassy that Toksie Turbie almost cried. You see, even though she didn’t know it, this was to be Toksie Turbie’s first Christmas. Can you imagine having your FIRST Christmas when you were eight-years-old? She was eight whole Christmases behind already! Remember all the rules Crudville had against anything frivolous? Well, you got it right, Christmas was one of them. Birthdays, too, but that’s for another story. Anyway, Christmas was outlawed in Crudville. Toksie didn’t know anything about it. She wondered what the big deal was about concerning the green man and woman in the red suits with all the white fake fur. She’d never seen anyone green before, other than herself. Everyone called them Mr. and Mrs. Claus. Sometimes, they called the man “Santa”. She wondered about all the elves and why they were working so hard building little things of all kinds that people were calling “toys”. After she was all settled into her room, Toksie put on her new red pants, green sweater and beautiful pink parka (the circus helped her get some clothes that weren’t beige). Then, she went for a walk around the North Pole Village. She visited all the shops with all the candy. She visited all the elves making the toys Santa would deliver. And, after she was done walking all about she bumped right into Santa, himself. Santa was so surprised that Toksie could see his green self, he didn’t even notice what she said about playing with her colors. “Huh?” mumbled a puzzled Toksie. “Don’t I know that!” said Toksie, remembering all her troubles in Crudville. “Yes, to everything you just said”, exclaimed Toksie. “The reason you see me as I really am is that you don’t know anything about Christmas and you have no expectations of what I should look like. So, no magic powder will work on you. And, we will talk about Christmas at the banquet day after tomorrow”, said Santa. Watch this space for the continuing adventures of Toksie Turbie at the North Pole Village. Now, to feed the SEO NAG MONSTER. It wants a link. 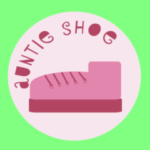 So, this time, Auntie Shoe made some designs, just like the pictures of Toksie’s wallpaper and bed linens. Just for something to link to so the Nag Monster can be fed. You do not need to buy anything. And, children DO NOT nag your parents for anything. If mom or dad says, “NO” then Auntie Shoe wants you to be good and accept that. But, if mom or dad feels like making a purchase, Auntie surely will not mind. 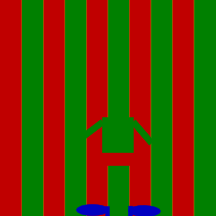 Products from CafePress, design by Auntie Shoe with the red and green striped walllpaper in her room at the North Pole can be found here, or click on the picture below. 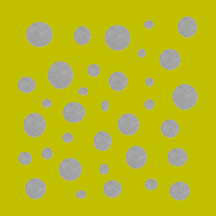 Products showing the gold with silver polka dot pattern on the bed linens can be found here, or by clicking on the image below. Sheriff Stephanie, Farmer Frank and Mayor Mike stood over the beige sofa where Toksie Turbie lay in the beige house. They pondered and discussed what to do with the baby. They knew that someone had to take care of her. They also knew that they had no way of finding out from where she had arrived. So, after much discussion and a loooooong consultation by telephone with Judge James, it was decided that Toksie Turbie would live with Farmer Frank. This was OK with Farmer Frank. He liked children and, well, Toksie was beige and that was his favorite color. Having it all decided, a beige crib and other beige baby essentials were found and Toksie Turbie was properly moved into her new beige home. But, while we, the author and the readers know Toksie’s name, the inhabitants of Crudville did not. So, it came about that the three adults needed to name the baby. Mayor Mike noticed a tag on her wrist. It only said “TOKSIE”. It was decided that that must be her name and, so, it was. The Turbie came later. Time progressed and Toksie grew. Much to the chagrin of Farmer Frank and the other residents of Crudville, Toksie did not remain beige. You see, for no reason that anyone could figure out, Toksie could change color at will. I mean, if she wanted pink hair, green skin, and blue teeth, she had them. She just had to think it and it was so. If she wanted pink polka-dots in her hair and orange stripes on her skin, she could arrange that, as well. As you can imagine, this ability was not appreciated by the residents of Crudville, who preferred everything to be beige. They had, in the beginning been jealous that Toksie was beige, as they, the residents were all sorts of normal people colors. So, Toksie was told in no uncertain terms that while white, black and other expected people colors were acceptable for her skin, no polka dots, stripes, or anything other than normal was allowed. Her hair could be blonde, brown, black or red, nothing else. And her teeth must always be white. Toksie complied. She only appeared in normal and expected colors. The town council even tried to force Toksie to pick one appearance for herself and stick to it, but, well, that’s how the Turbie came into play. It was the first time Toksie went ballistic. She was four. She had agreed to all their rules. She lived without polka dots and stripes and didn’t make her skin green ever. But to be told she had to pick just one hair color, one skin tone and only white teeth, well, she just had HAD it. 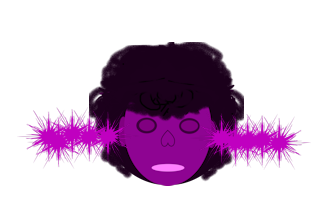 After the town council gave Toksie the news, well…first, her skin turned bright purple. Then her hair turned dark purple. Then her teeth turned a kind of light-purple, but not quite lavender. And, THEN things got really scary. WEIRD SHAPED PURPLE STEAM CAME OUT OF HER EARS. I mean, real steam. You never saw anything like it in your life. It was like Toksie was going to explode. Next, Toksie ran around all the town council’s desks at once 100 times and it only took ONE SECOND. After that, she jumped 100 feet in the air, right through the roof she went, and came down on the other side of the town council’s desks. Toksie went on to say that it was her body and if she wanted to wear it anyway she wanted no one should mess with her. A frightened town council agreed that she could do as she pleased, as long as she chose normal colors, or, of course, beige. But the “turbo” thing stuck, and after that day she was known as “Toksie Turbie”. That scary day when the town council tried to make her choose one appearance was not the last time Toksie Turbie turned purple. Nosiree, not the last. You could do almost anything to Toksie Turbie except be unfair or mean. Or, even worse, to be unfair or mean to anyone when she was around. Bullies did not exist in Crudville when Toksie was around. She turned all kinds of shades of purple and ran around them 100 times in one second and then jumped 100 feet in the air and came down on the other side of them. Scared the living daylights out of every bully in town. Why there was the time little Julian was being teased by his big brother, Roger. Toksie Turbie was sooooooooooo mad at Roger she turned turned shades of purple and ran around him 100 times in one second TWICE. Scared Roger so badly he was the nicest person in town for the rest of his life. Then there was the time Sally, the teenager, made fun of the dress her classmate, Joan, was wearing. It was the proper shade of beige and all, but OMG Sally didn’t like the way the dress fit. Sally was so mean it made Joan cry and Toksie Turbie went COMPLETELY TURBO all over Sally. Sally was the kindest lady in town for the rest of her life. Toksie lived by the agreed rules. Well, sort of. In her beige room with all the beige furniture and all the beige everything, with the door closed tight, Toksie Turbie changed colors whenever she wanted. She would sleep with green hair, orange teeth and teal skin. That was every Tuesday. On Wednesdays, Toksie Turbie would sleep with pink and blue polka dots on her teeth, grey and salmon striped hair, with yellow and green swirls for her skin. The rest of the days were according to her mood, but Tuesdays and Wednesdays were set. Still our Toksie was very unhappy because well, someone as colorful as she just was not going to be happy in a place that only loved beige. No one in Crudville had ever heard from Mortimer Thaddeus Snodgrass III, Morty for short, since he had left Crudville with the banned circus all those decades before. Morty was grown now. He had had all kinds of magical adventures. But, he’d used his one wish from the magical wishing ring and the three from the magical wishing hat. He was an adult and so, he had a job and all that cool stuff. He was, now, the ringmaster for the circus. And, for no reason that Morty could ever figure out, he suddenly knew he had to go back to Crudville. So, he led his circus to the town only to be told that they would have to leave the next day. No shows were allowed. But just like Morty, all those years ago, Toksie Turbie, who was now eight-years old, took the opportunity to apply for a job. She didn’t know what she could do that was interesting. I mean, it never occurred to her that being able to change color would interest anyone because it was so disapproved of in Crudville. Morty looked at Toksie and asked her why she wanted to leave Crudville. Toksie confessed, “I HATE BEIGE.” Morty laughed and said, “So do I.” That made Toksie laugh, too and well, she forgot herself while she was laughing and her skin turned a happy shade of yellow and her hair went blue. Her teeth stayed white, though. When she caught herself, she apologized and promised she’d never do it again. To which Morty asked if she could do that whenever she wanted. Toksie said that she could and Morty told her she was in the circus now for sure. So, Toksie Turbie went home to Farmer Frank, packed her all her beige bags and all her beige clothes and all her beige everything else. Then she said good bye to Farmer Frank, Sheriff Stephanie and Mayor Mike. She thanked them for taking care of her. Then she danced off to the circus and blew that beige town for good. Where will the circus take Toksie? We will just have to see in our next installment. Now it is time to feed the SEO Nag Monster. It wants a link. So, I am feeding it this link to my the brand spankin’ new Toksie Turbie shop. It has Toksie Turbie gear available there.Some other things are in the CafePress marketplace. But the Nag Monster only wants one link. You are welcome to buy something. HAVE FUN!